Top-tier technology is one of the many things that the 2017 Honda Civic Sedan can bring to the table to outpace its erstwhile rivals. 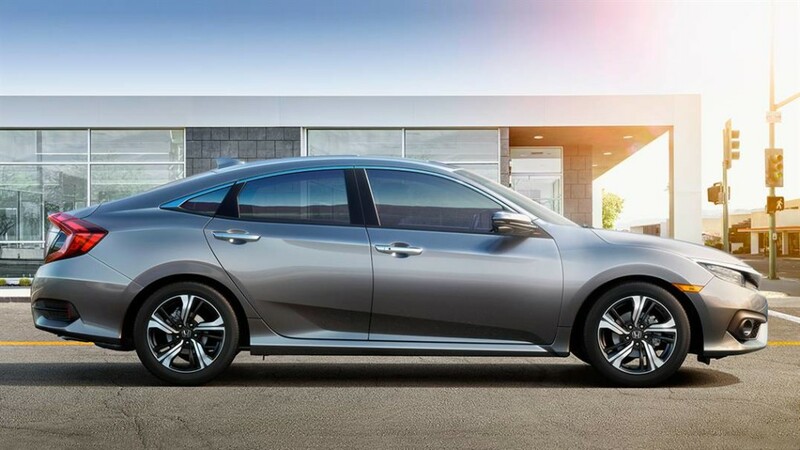 While plenty of lesser compact sedans are content to offer the bare minimum as standard and a decidedly uninspiring selection of available amenities, the Civic Sedan starts strong and then continues to impress as you work your way up its five available trim levels. To give you a taste of what’s on offer, we’ve singled out a few of the vehicle’s standout technologies. Multi-Angle Rearview Camera: Every Civic Sedan comes with a standard Multi-Angle Rearview Camera. It activates automatically when you enter reverse to provide a clear idea of what’s behind you, and allows comprehensive coverage thanks to three separate viewing angles: Normal, Top-down, and Wide. Apple CarPlay/Android Auto: Sync up either iPhone or Android devices to your 7-inch touchscreen, then make calls, send and receive messages, or access compatible 3rd-party apps. With Apple CarPlay, use Siri to get information; with Android Auto, take advantage of Google Maps and Google Now. Honda Satellite-Linked Navigation System: This Garmin-based satnav system provides 3D renderings of terrain, buildings, and road signs, plus plenty more. Need to find your way through Goshen or Monroe during rush-hour? Just use HD Digital Traffic to stay ahead of current gridlock. You’ll even receive free map updates for 5 years. Premium Audio System: If you’re cruising along the Hudson river or zooming towards the Manhattan skyline, you want the right driving soundtrack pouring out of the speakers. The Civic Sedan’s premium system can call on up to 450 watts of power and 10 crystal-clear speakers to immerse you in high-quality sound. Remote Engine Start and Smart Entry: Remote Engine Start lets you get the Civic Sedan purring before you even slip inside; as you approach, the vehicle will recirculate cool air if temperatures are over 82 degrees or activate the defrosters if it’s under 40. When you arrive, use the Smart Entry function to unlock the doors with just the touch of the handle. Wireless Phone Charger: Modern drivers reply on their smartphones more than ever, so running out of juice just isn’t an option. If you notice that your phone is only on 5%, just place it on the available flat charging surface to top up the battery while you drive without having to worry to plug in any wires. Honda Sensing Suite: Bundling several state of the art driver assistance technologies together in one exceptional package, the Honda Sensing Suite offers Road Departure Mitigation System (RDM, Lane Keeping Assist System (LKAS), Collision Mitigation Braking System (CMBS), and Adaptive Cruise Control (ACC) with Low-Speed Follow. The 2017 Honda Civic Sedan has reinvented expectations over what to expect from a compact sedan. To find out more, just contact one of the team here at Middletown Honda today.